This snowy plover chick is one of hundreds that have successfully hatched at Coal Oil Point Reserve, which protects the threatened species. 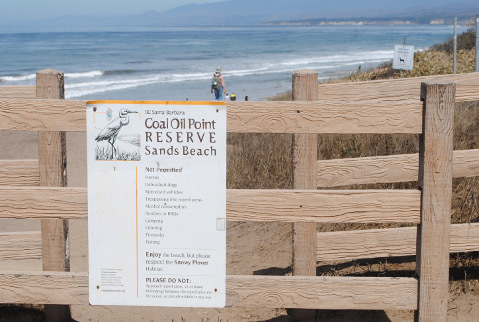 Scientist Cristina Sandoval’s usual day as director of the 170-acre Coal Oil Point Reserve (COPR) includes a walk on the sandy beach and dunes of the special place she and biologist Kevin Lafferty have called home for nearly 20 years. 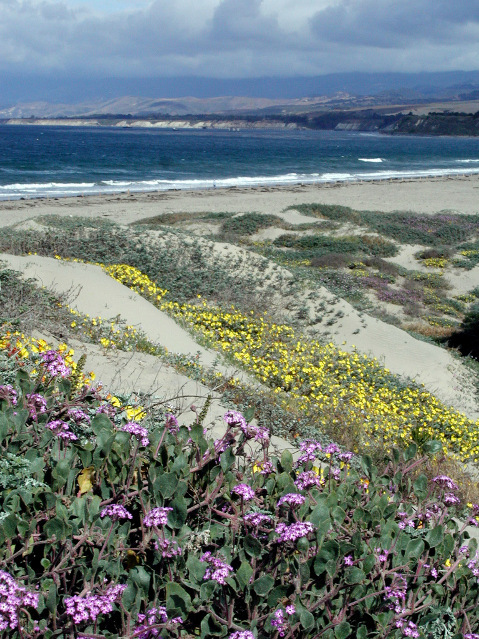 This scenic area of the coast near UC Santa Barbara includes Devereux Lagoon and Sands Beach. It is where an abandoned breeding area for a small shore bird threatened by extinction has been restored to vitality. 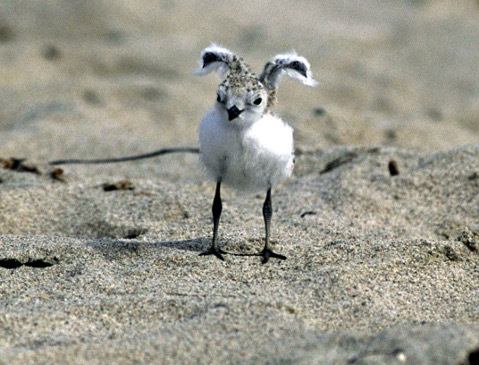 Helped by a dedicated staff and many volunteers from the surrounding communities, particularly the Santa Barbara Audubon Society, Sandoval found ways over the years to re-create a secure place for the western snowy plover and other birds that feed, breed, and lay their eggs on sand or in muddy wetlands. She and a group of docents have done this while the popular Sands Beach remained open to surfers, strollers, and sunbathers. When Sandoval assumed responsibility for COPR in 1998, she quickly found a degraded habitat with “lots of problems,” she recalls. Invasive species were crowding out native plants that keep the dune ecosystem healthy; walking trails disrupted wildlife and plants; bird species like the plover and least tern were in decline or had virtually vanished, along with the badgers, deer, and large mammals that once lived along the coast. 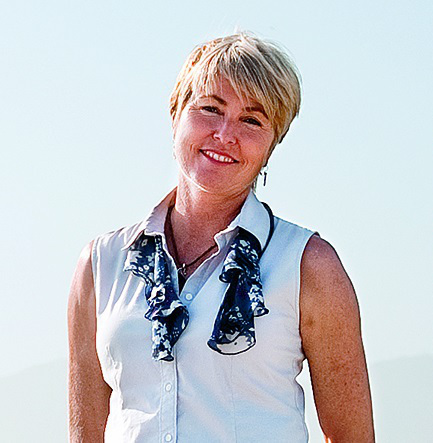 Lafferty, who is affiliated with UCSB and the U.S. Geological Survey, laid the scientific foundation for the reserve’s rebirth by carefully documenting the main factor behind the birds’ decline. “It was humans,” says Sandoval. “People were walking all over the beach, and the plovers could not find a spot to nest without some disturbance.” Predation played a much smaller role. She developed a management plan that confronted the interlocked problems with a continuing habitat restoration effort, educational public outreach, docent training, and plover protection. The docents’ powers of persuasion and some 2,500 feet of rope fence that symbolically separated humans and plovers were key elements. Many fellow scientists doubted it was possible to bring back an abandoned breeding site. It had never been done before, they said. COPR’s past 15 years provide an answer. Sandoval points to a growth of successful breeding pairs from zero to an average annual rate of 20. Small as that may seem, the number of baby plovers who survive to fly with the flock, while fluctuating from year to year, has been relatively steady over the past decade. Some years a single, clever predator can lay waste to many nests, she says. Skunks have been an ongoing problem, but a wire fence on the land-side of the nesting area has diminished their threat. Staff biologist Jessica Nielsen, who heads the docent training program, reports that the annual average of fledglings since the first chick was born in 2001 has been 31. The 2016 season was a very good year with 49 fledglings. This is all the more remarkable since the May 19, 2015, Refugio oil pipeline rupture impacted the reserve in the middle of the nesting season. While only two plovers seem to have had oiled feathers, many swallowed toxic elements when pecking beach hoppers from the masses of oil-laced kelp, according to Sandoval. “This may have caused increased infertility in the breeding season following the oil spill,” she said. Sandoval and Nielsen noted that cleanup activity disturbed nesting birds. They worked with the crew supervisor to time the removal of contaminated piles of seaweed to when the birds were farthest away. If a bird left its nest for more than five minutes, they asked workers to move to another spot. “They were eager to learn how to lessen their impacts,” Sandoval said of the crewmembers she worked with. Sandoval will practice those skills as she renews fund-raising efforts to finish renovating and furnishing a building on the old Devereux campus that is slated to become a new Nature Center for COPR. 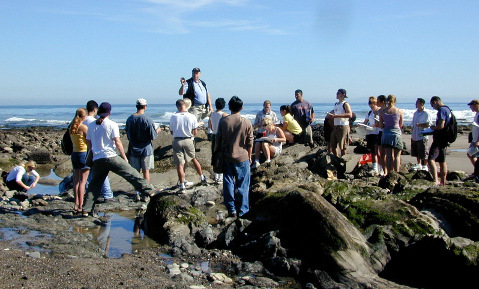 An intertidal class visits Coal Oil Point. To this observer, it looks like we will need those skills and values sooner rather than later. Thanks to Cris Sandoval and her loyal corps of helpers, the Goleta Valley has regained lost ground in the struggle to save a local jewel of nature.